Plan an authentic island escape to Coco C, a water-view vacation rental in Fern Grotto Inn. 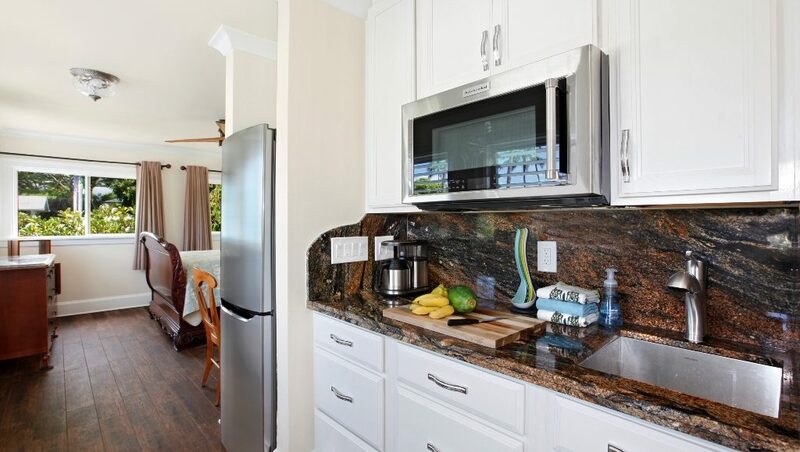 Located just a stone’s throw from the beach on the east coast of Kauai, this one-bedroom upper unit in a four-unit cottage caters to couples in search of some rest and relaxation. Drift to sleep in a king-size bedroom with a mirrored closet, and refresh in a brand new bathroom with indulgent double shower, bidet, and contemporary pedestal sink. Sip morning coffee as you take in Wailua River views from your second-floor windows. And mix up frozen cocktails in a stocked kitchenette with full-size fridge, convection oven, microwave, and blender. When you’re ready to explore your tropical surrounds, your options are nearly endless. Walk one block to Wailua Beach and lounge on pristine white sand. Pack a cooler with fresh seafood from Fish Express, and enjoy a picnic lunch in Lydgate State Park. Hop on the two bikes provided for you, and pedal along the scenic Kauai Path. Paddle down the river with complimentary kayaks and stand-up paddle boards. Or hike through Wailua River State Park to discover a secret waterfall and refreshing swimming hole. plus tax of 14.42% and a one-time cleaning fee of $125. This bed has been swapped with Coco D bed.